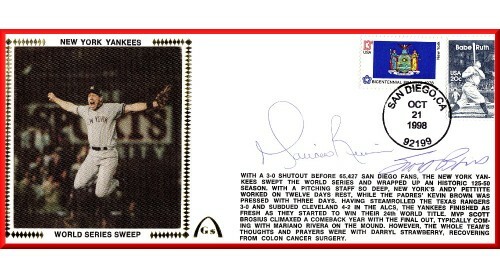 New York Yankees World Series Sweep Large #10 Envelope (Brousius Photo) - Scott Brousius & Mariano Rivera (1998). Gateway Acquired Several Different Autograph Groupings On This Envelope. ONLY A Few Of This Combo Remain, But There Are Several Different Special Stamp Combos.